What a full feeling I have, the day after my students give their recital! My studio's fall recital yesterday left me feeling very proud of the accomplishments of all my students and their growth over the months and years. At the end of each recital, I take the opportunity to call up each child, one-by-one, to acknowledge their violin progress and also whatever ripple effect his or her violin playing is having on his or her community. This last part has nothing to do with me, but when one of my students is playing in the school orchestra, youth orchestra, jazz band, Suzuki group, if they are helping teach other kids, playing at their church, singing in the choir -- I think it's all to be commended. I have a small studio (about 15 students) and my recitals are likewise small, but over the years I feel I've figured out a few things about putting them together. Here is a checklist of things to do, to prepare for a recital. Please feel free to add your own ideas in the comments! 1. Hire a good accompanist. This is the first call I make, even before setting the date. I see if one of my preferred accompanists is available. A good accompanist can roll with whatever the students throw his or her way. A good pianist is not always a good accompanist, so be sure that you know your pianist for his or her collaborative abilities. 2. Secure the venue and set the date. The sooner you set the date, the sooner you can commit to every aspect of the recital. Students will have their other important commitments (soccer, tennis, school musical, etc.) and you may want to check a few of those. (If you set the recital on the day of their graduation ceremony, or their required school concert, or the youth symphony concert, that's a big conflict.) But if you can tell parents several months in advance to reserve the time and date, there is a much larger possibility that you will get high participation and that just maybe, this is the one soccer practice they miss because they have an important and mandatory violin recital! About the venue, pick something that suits the size of your studio. The little chapel at my own church is just beautiful, so I hold my recitals there. I feel lucky, as it took me a while to find such an ideal setting. If you have a hard time finding a place for the recital, you can ask your students' parents if they have connections; I've had some really lovely recitals at people's homes as well. Keep in mind, the venue should have a decent piano that is in tune. This can be a complete deal-breaker! So make sure you are familiar with the piano (bring your tuner, see where the "A" is at) before you sign a contract. You will probably have to pay to use a public or church facility. 3. Pick what your students will play. My general rule is: it should be completely memorized a month in advance of the recital day. We make the final choice of each student's repertoire about a month in advance. They may be working on other, more advanced pieces, but the recital piece needs to feel comfortable and extremely practiced and familiar. 5. Rehearsal. I have everyone come to the venue where the recital will take place and play with the pianist. I try to schedule the rehearsal at least a week in advance for the "Wow, I had no idea but I really need to work on this!" revelation that inevitably occurs! Sometimes it's hard to schedule this in the venue, but I really aim for that, because I think it helps performers to hear themselves in that space, imagine themselves playing in that space, etc. 6. Reception. Are you going to have a reception? I've found it easier to do the reception as a potluck. I have the families sign up to bring something in the 2-3 weeks before -- using a sign-up ensures that they can see what others are bringing and we don't wind up with 10 veggie trays, or conversely, 10 plates of cookies! I provide the drinks, cups, plates, tablecloth, etc. Be sure to bring several trash bags, if you plan a reception, and ask kids and parents to help you clean up afterwards so you can leave the venue in good shape. 7. Program: The week before the recital, I type up and print the program. I try to make it look nice! This time I drew the picture you see at the top of this article. If you can, print the program several days before the recital, so you don't wind up in a mad dash on the day-of. 8. Awards. Not necessary, but I make everyone a certificate that acknowledges the piece they have just performed. I've known teachers to give out practice awards, for most hours practiced, or awards for those who practiced 100 days in a row. I give the certificates at the end of the performance and use the occasion to acknowledge students both for their violin accomplishments and also for what they have been doing in their violin lives -- if they play in youth orchestra, school orchestra, band, church, teaching, giving performances at nursing homes, etc. etc.. This allows other students and teachers to think about what possibilities are out there for making the violin become a part of their lives. Because ultimately, that's what this is all about: teaching them to play the violin so that they are free to go whatever direction they wish with it and use it to enhance their own lives and the lives of others. P.S. 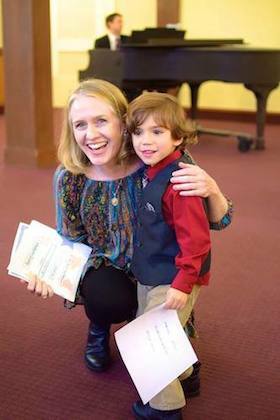 At right is my newest student, Sebastian, 4, whose certificate was for "First Recital"! November 17, 2014 at 11:02 PM · Oh, how I love recitals! I agree they are very rewarding. November 18, 2014 at 02:13 AM · Are the arrangements by Martha Yesuda available to the public? November 18, 2014 at 02:53 AM · Yes, Here is the link to Martha's website, where you can buy her arrangements. One thing I do add to my recital and group class concert programs is full names and dates of all the composers as well as country of origin. I also include some inspirational sayings in the program -- things to help the parents remember why they're doing what they're doing (as if the recital weren't reason enough... which it isn't -- it's a part of the equation). Since I teach in English and in French, I try to include at least one English quote and one French one. Always enjoy your blog -- thanks! November 18, 2014 at 04:47 AM · Loved the article, Laurie! I was happy to see that we approach recitals in a very similar fashion. I think it's great for you to write out practical and crucial steps to help others along the way towards enjoying successful recitals, too. BTW, I wanted to let you know that some of my violin teacher friends have given entire student recitals using my 2nd violin accompaniments. Especially if they are having a hard time locating a pianist for their recital. There is something quite special about having the piano, but it's also great to know there is an alternative backup plan...! November 18, 2014 at 01:37 PM · I agree that the pianist goes in the #1 slot of the recital to-do list. The pianist I use for student recitals is incredible on all counts, and I have her take her own solo bow at the end of the recital. November 19, 2014 at 03:39 AM · Your planning guide for student recitals is excellent. I agree with every point. November 19, 2014 at 09:59 AM · Lovely article Laurie - I find myself wishing I could join your studio (but the commuting costs would kill me)! Actually, do you have any adult students? Years ago I took lessons with my son's teacher in order to encourage him to not drop the instrument (it failed) but I had to do the recital - 6 kids and me. Now (after returning to the violin) I have a private teacher but as he is not in a studio there are very few performance opportunities. I wonder if there is a 'market' for several private teachers to collaborate on an adult recital night? November 19, 2014 at 03:14 PM · I've had adult students in the past, but none at present. There is a teacher (in Glendale, Calif. - still a bit of a commute for you, Elise!) who has a mostly adult studio and holds chamber group lessons for them so they have that chance to play. There must be other teachers who specialize in adult students, it's a great idea! November 20, 2014 at 04:44 AM · Washington DC has the Friday Morning Music Club that gives collaborative recitals between adult amateurs, but in general the performances are expected to be quite polished -- more for the semi-pro player than the true amateur. Pianists have a society for adult amateur pianists to play for one another. There's nothing similar for violinists, though. I've often thought it would be awesome if someone would coordinate something with the retirement homes and whatnot and attract chamber and solo performances for periodic recitals by adult amateurs. Here in central VA we have the Richmond Music Study Club. It is a branch of a larger national organization. Among other things, the group promotes adult music education. RMSC held a mixed piano and violin recital for adults last month, of which I was lucky to have been invited to take part. The opportunity to play for and network with other adult students was fantastic. If you are in the US, you might want to check out the National Federation of Music Clubs for opportunities in your area. I believe there are similar organizations worldwide as well. Best of luck finding performance opportunities. I had a hard time finding them myself.